The sight of Baltimore city students huddling in coats in freezing classrooms amid bitter cold temperatures touched a nerve across the country yesterday, with Republican Governor Larry Hogan dismissing talk of providing aid for repairs, Democratic gubernatorial challengers denouncing him for it and the teachers’ union calling for all schools to be closed until the buildings can be made habitable. “The older children will walk out when it’s this cold – but it’s the little children who have to sit there in their coats and hats and gloves and have no way to leave that I’m worried about,” said Marietta English, president of the Baltimore Teacher’s Union (BTU). After teachers complained yesterday of classrooms with temperatures in the 30s and 40s, the union called on schools CEO Sonja Santelises to close all schools so that heating issues could be the assessed and repaired. English said the prolonged period of freezing temperatures was unusual, but that it didn’t justify failing to prepare the buildings for the students’ return. “The school system should have anticipated the problems the cold would cause after the holiday break,” she said. In a sharply-worded letter hand-delivered to school headquarters, English derided Santelises for her reassuring statement issued Tuesday – ahead of her decision to open most city schools on time Wednesday morning. Along with anger at school officials’ handling of the immediate problem today came a deeper criticism, from some, for the historic under-funding of Baltimore’s predominantly African-American schools. “When we discuss systematic inequality & institutional racism, this is a glowing example,” ESPN’s Jemele Hill tweeted, as the story received national coverage. Some, like parent Nikki Massie, posted accounts of their own shivering children in city schools. “My 16 year-old daughter texted me from her seat in a Baltimore City Public School, ‘Mom, I can’t feel my toes. There’s no heat in school today!’” Massie wrote on Facebook. Others asked where they could donate a space heater? 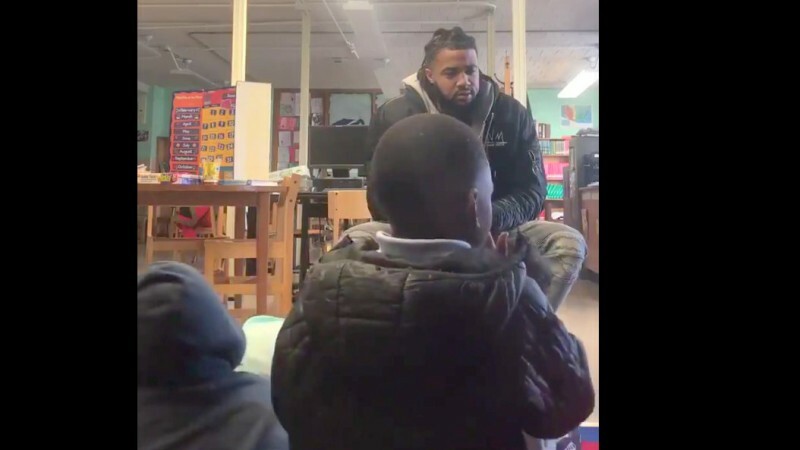 One answer came from ex NFL player-turned city school arts mentor Aaron Maybin – who is promoting a GoFundMe site to buy 600 heaters, as well as coats, hats and gloves. As part of the effort, Maybin posted a video of his students at Matthew A. Henson Elementary School wearing coats in his classroom, which he said was about 40 degrees yesterday. At the West Baltimore school where he is a teacher-mentor through a program called Leaders of Tomorrow Youth Center, electricity has only worked in half the building since students returned from break. “I’m told it was due to nobody being there during the holidays to make sure the heat stayed on and pipes didn’t freeze,” Maybin said. Maybin was livid about the conditions his students endure. “The fact that everyone is just looking at the video today and getting outraged about the situation – but not when it comes time to hold our school system and politicians accountable on that same issue – outrages me,” he said, noting that the issues he and the children run deep. She reiterated past comments that staff had checked out school buildings (“our facilities team did not have a holiday break”) and explained that extreme weather and fast-changing conditions may have caught them by surprise in some cases. “We have had unprecedented frigid temperatures – two weeks solid – that has not happened, in terms of the people I’ve checked with, for well over a decade,” she began, in the video Q&A conducted by her chief spokesperson, Edie House-Foster. School officials did not respond to a request from The Brew to explain whether a memo from Santelises that we obtained – giving the central office December 28th and 29th off – may have led to many facilities workers failing to come in over the weekend to prepare schools. Dec. 13 memo from City Schools CEO Sonja Santelises to “Admin. Hdqtrs.” announcing extra days off during the break. About 60 schools were the subject of weather-related complaints according to Santelises, who said in the live video that facilities teams would be checking buildings out over the next 48 hours. “If we need to close schools we will, but I want it to be based on data, not based on just a collection of information that in some cases has been resolved,” she said. “Too many of our buildings have outdated heating systems, poor insulation, and aging pipes as a result of years of inadequate funding for maintenance and facilities improvements,” she said. Teacher Corey Gaber said long-term funding issues shouldn’t obscure the school system’s shorter-term failings when it comes to decision-making about school closures. “They need to make more humane, more consistent, smarter, quicker decisions on when to close a school and why,” said Gaber, who teaches 6th grade English at the Southwest Baltimore Charter School. Understanding that each school is different, a threshold temperature of perhaps 60 degrees could be set for a guideline, he said. Patterson High School barely has heat and there’s literally water spraying out the heaters? With not enough maintenance workers, the school system “should empower principals to take a temperature reading,” Gaber said. Children are often in school for two or three hours before facilities staff arrive to tackle problems, he noted. “This is not a new problem,” said Gaber, part of a teachers’ group called BMORE (Baltimore Movement of Rank and file Educators). It didn’t take long for the plight of Baltimore students in under-heated buildings to become political fodder. Treasurer Nancy K. Kopp, a Democrat, put the issue before Gov. Hogan in Annapolis yesterday. The past focus by Hogan and Comptroller Peter Franchot on air conditioning in schools, Kopp said, may have hurt funding for heating or other needs. Hogan replied that the state had already put “billions of dollars” into city schools. Pretty soon, Lt. Gov. 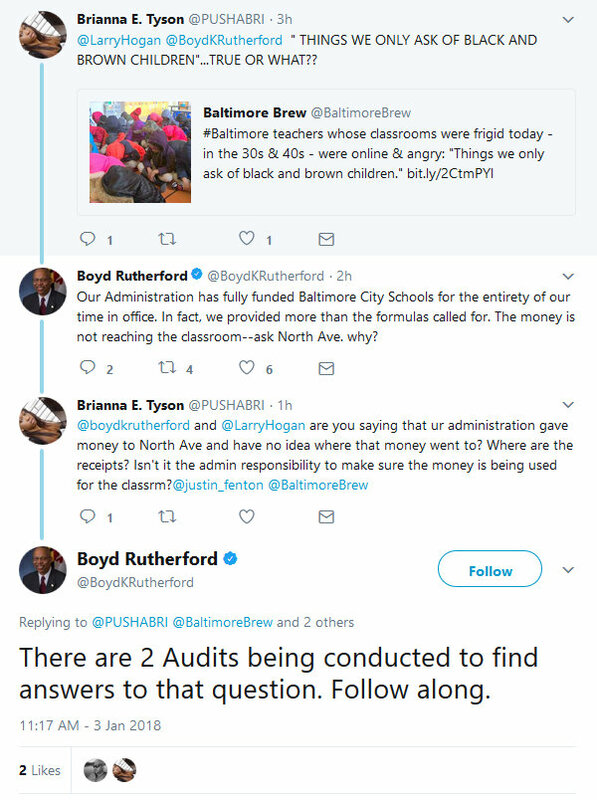 Boyd Rutherford was coming to Hogan’s defense on Twitter. Boyd Rutherford responds to critics on Twitter. Democratic candidates who have announced plans to challenge Hogan – Ben Jealous, Rich Madaleno and Krish Vignarajah – all denounced him yesterday. “The whole AC debate was a political charade to attract votes in Baltimore County,” he said, noting that some of the city schools HVAC projects delayed are now among those experiencing problems. Asked for comment on the school heating crisis, Mayor Catherine Pugh said the matter is under the purview of the city schools CEO and the president of the school board. She noted that, since 1997, the state has had oversight of city schools. Pugh said she contacted Santelises yesterday to encourage her to answer the media’s questions about the school building problems. For those listening, the loudest comments yesterday were the ones that came en masse from parents, teachers and students. Four schools with heating problems were closed. And some additional shutdowns took place – Frederick Douglass High School and Cecil Elementary School closed early. But most schools opened on time and City Schools’ Twitter account was under siege by people demanding their cold school be closed for repairs too. The Baltimore Polytechnic Institute building barely has heat and it takes a while for the heat in the building to actually have results, please consider a closing. Patterson High School barely has heat and there’s literally water spraying out the heaters? I don’t understand. Also we had a fire “drill” and it was just as cold outside as inside. Please close Patterson High how are we supposed to learn? Carver go-tech has busted pipes in the lunch room and is freezing cold how can we learn like that? LIES!!! Why so many schools without heat. Leith Walk, Furley, Patterson, Western, Poly, and others. By the time the heat comes on and warms the buildings it will be Friday. This is sad. But I’m sure North Ave has adequate heat! Today, they got their wish and schools were closed, though not for the precise reasons they wanted them to be. As forecast, a bitter wind was blowing and snow was falling across the city. – Reporter Fern Shen can be reached at fern.shen@baltimorebrew.com or Baltimore Brew, P.O. Box 5626 Baltimore, MD. 21210.